Sometimes technology just works, and when it does, it’s such a pleasant experience. Such was my experience setting up and using the Jabra Freeway hands-free Bluetooth speakerphone. For those of you who scorn instruction manuals and even scoff at “Quick Start Guides,” you’ll be in your element with the Freeway. From the start, the device literally “talks” you through the setup procedure. Pairing with the latest gen iPhone was completely automated. I didn’t even have to punch in a pairing code. The Freeway will actually handle two devices simultaneously, so you and your significant other needn’t touch your phone again, once you enter the car. One choice you will have to make however is deciding which phone will do your automatic dialing. By speaking a name (“call Jim Smith, work phone”), the unit will do a voice match with your phone’s contact list and automatically dial the number. When two phones are connected, you’ll have to designate one as the master calling unit. As you enter your car, a gentle voice says, “Connected” and as you leave the vehicle, the unit shuts itself off. 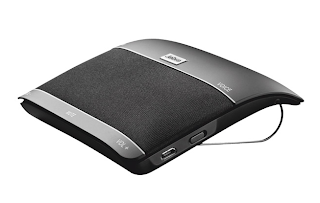 I’ve only charged the unit once in the first month since I’ve been using it, so it’s easy to believe Jabra’s stated 14 hour talk time and 40 day standby time ratings. But as well as the technology works, a unit is nothing if it doesn’t have good sound. That’s where this little gem really shines. With three speakers, its “virtual surround sound” system is a joy to listen to. Most noticeable to me was the fullness of the sound. I was looking for a speakerphone that could play my MP3’s from my iPhone while I drive. With virtually no exception, all the units I tried previously just didn’t cut it. Most of them just did not have sufficient volume to overcome the road noise when windows were left open. With the Freeway, that’s a problem no longer. That’s also extremely handy using my phone as a GPS. Check out the Jabra Freeway online at Jabra.com or from any of your better electronics dealers. I know you’ll be pleased with its performance.